In certain areas of your adult life, you will need to take out a loan – to buy that car to get to work, to get that mortgage to own a home, or maybe to host a beautiful and festive wedding. Whatever your reasons, obtaining a loan will help you finance those larger purchases. Unsecured loans occur when a creditor lends you money and does not have a security interest in anything that you own. Credit cards are unsecured loans unless you have a card that is secured through your bank account with a credit line limited to the funds in that account. Personal loans are usually unsecured, and the terms of the loan are determined by your creditworthiness. For example, if you have bad credit (below 550), your interest rate may be very high. For those who have an excellent credit score, obtaining such financing is not a difficult process; being a low credit risk means that many lenders will be more than happy to work with you to get the amount and terms that are agreeable to both of you. The problem arises for those who do not have a great credit score. 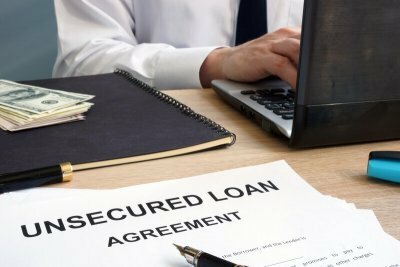 If you are one of those people, you may think that you are not able to secure a loan at all, but that’s not necessarily true. You can still get a loan with bad credit. A bad credit loan is a special type of lending arrangement for those whose credit score is less than stellar. There are lenders who are willing to work with you to secure a loan, with no credit check, when others would reject you based on your credit score alone. These lenders will look at other factors outside of your credit score to determine your creditworthiness, or your ability to pay back a loan. Assuming you agree and comply with the terms of the loan, then you can still make that purchase and have the chance to improve your credit score at the same time. You can take a look at your credit report to find out. For example, if you have missed or late credit card payments, have an inconsistent employment record, or have declared bankruptcy – all of which will be listed on your credit report – then you most likely have bad credit. Even if you are on the road to financial recovery, it will take a while before your credit report and score will change for the better. However, by obtaining a bad credit loan and paying it back promptly and in full, you can gradually yet consistently make those positive changes that you need. Do you qualify for an unsecured loan? After all, not every lender is willing to accept you as a risk, depending on your credit score and report. Firstly, you need to locate those lenders who are willing to extend bad credit loans. Next, as with any loan, you need to meet the lender’s qualifications. While every lender will have different qualifications, it is likely that you will be expected to have a consistent, monthly income at a stable place of employment. You will also need to provide proof of a permanent residence, whether it be renting or owning. Additionally, you will probably need to indicate that you are current with any other debts, such as your credit cards. Keep in mind, lenders will still review your credit score and report to understand any trends in your finances; if you have been working on improving them, then lenders will see that and view you more favorably as a relatively worthy risk for a bad credit loan. Though the basic principle of a bad credit loan is the same as others – you receive a large sum of money that you pay back, with interest, every month, until the amount is paid back in full -bad credit loans do have their differences. For example, the interest rate you receive will likely be higher, possibly much higher, than it would be for someone with a better credit score. Next, the loan will probably be secured rather than unsecured. This means that you will need to offer some type of collateral, such as a car, that can be held by the lender until you pay the loan in full. If you default at any time, even with the last payment, then the lender can confiscate that item. Finally, you will have less negotiating room, if any at all, when discussing the terms of the loan. Although having bad credit now may seem bleak for your future, it doesn’t have to be. By making small, continued, and positive changes in your finances, you can still obtain a loan even with bad credit, and work your way towards being a great credit risk.